Hello and welcome to the new VanTrippin.com blog. Our vision for this blog is to create a place where van campers can share their journeys, tips and more with the rest of the VanTrippin community. If you love camping in your van, stay tuned. There will be lots of changes to the blog over the next few months as we add new features and refine the site. Thanks for your patience and we look forward to hearing from all of you. 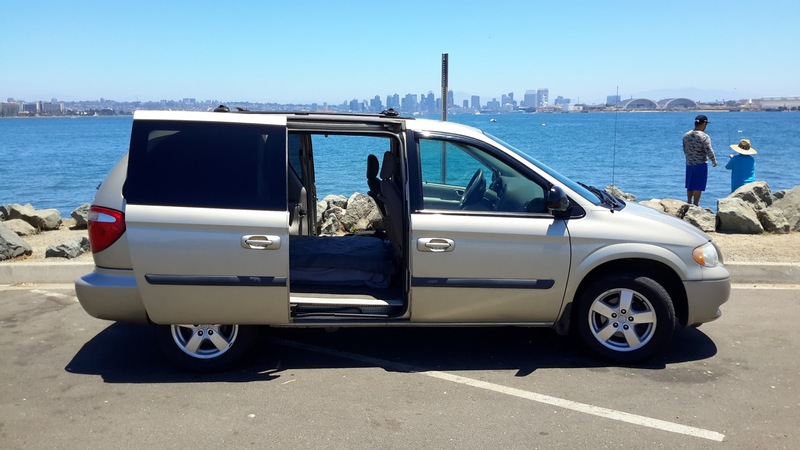 Here's my 2005 Dodge Caravan with the San Diego bay and skyline in the background. I'll be beating the heat in California for the rest of the summer. Nice! I love my van. You'll find it perfect for traveling. I like being able to sleep in my vehicle comfortably and my van gives me that. It makes me feel like I can go anywhere. Now, where are the photos of your custom made teardrop trailer? Submit your story or helping tip here. (c) Travelife Media, LLC 2016 . Picture Window theme. Powered by Blogger.